IMG Patriot Group Travel Insurance is one of our premium overseas team medical insurance for our clients heading outside the U.S. This group travel plan also provides non-U.S. citizens with coverage outside their country of residence and country of citizenship. We have a great power point on this plan located here at https://www.gninsurance.com/patriot-short-term-team-insurance/. We also have a great handout our marketing team at Good Neighbor Insurance created located here at https://www.gninsurance.com/documents/IMG-Patriot-Group-Travel-insurance-handout.pdf. The insurance company, IMG, has an amazing emergency medical team on staff to help, if and when severe situations occur. Some of our team have actually visited their headquarters and learned how their emergency procedures work. They were quite impressed! Like all of our other excellent international travel insurance plans, this plan provides coverage for new injuries and new illnesses, Medical Evacuation and repatriation, Return of Mortal Remains, and more. Some of the unique additional benefits of this plan are the End of Trip Home Country Coverage, Natural Disaster insurance, Terrorism insurance, Political Evacuation insurance, and Trip Interruption. (Regarding the Terrorism and Political Evacuation coverage — it is not available in countries that have a current travel advisory in effect on or within six months prior to your arrival in country.) If there should be a natural disaster, the plan will pay $100 a day for up to five days if you are displaced from planned, paid accommodations due to an evacuation following a natural disaster, or from a forecasted natural disaster. 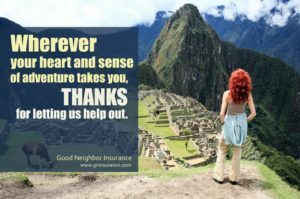 Trip Interruption insurance is coverage to go back to your home country if your family member unexpectedly perishes, or your principal residence is destroyed (by fire or natural disaster) or was broke-in to. Please click here at https://www.gninsurance.com/patriot-short-term-team-insurance/ for the most up-to-date brochure on the IMG Patriot Group Travel. Good Neighbor insurance agents at 866-636-9100 / 480-633-9500 are here to serve you during Arizona business hours. Or you may go to our corporate site at https://www.gninsurance.com/. If you want you can email us your questions and request at info@gninsurance.com.